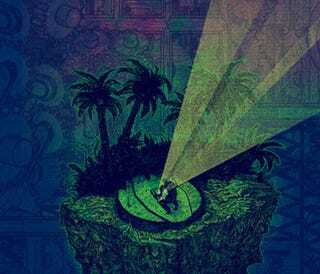 Lost has promised to answer all of our burning questions about the island and its mysteries - maybe tonight, maybe sometime soon. But we can't wait, so here are our 50 best theories about the true meaning of the show. We're pretty sure that at least some of these theories have a grain of truth to them, and maybe the real answer is some combination of all of these. If you're looking for a more strait-laced bit of theorizing, check out this post from a couple weeks ago. Feel free to add your own ideas in the comments, and the best answer will get a fish biscuit sent via email. Oh, and there are no spoilers in this post, unless you're not up to date. The island is built on a huge deposit of unobtanium. The island is a resort that makes your fantasies and wishes come to life but it's gone wrong. The Smoke Monster is a contractor who built the island for Jacob and never got paid. The Oceanic 815 passengers are unknowingly aliens who were trapped on the island for the protection of society. Some powerful entity wanted to see if it could combine Lord of the Rings and Lord of the Flies on one island. It's all a breeding program to create the ultimate superbaby: Aaron. Jacob and the Man in Black are one guy with a split personality. The Numbers are Jacob's high school locker combination. The island doesn't just heal people, it supercharges them (with drama). The island is an asteroid which crashed to Earth - killing the dinosaurs. The island is a huge engine that runs on the power of unresolved daddy issues. All of those books on the island were taken out of the Library of Alexandria (even though they were published later; it's a time-travel thing) and by now the late-library fees are all the wealth on Earth. The island controls the stock market. The island is the Egyptian afterlife, and the Others are all attendants who were entombed with Jacob's sarcophagus. The polar bears planned it all. Because they're cyborgs. Underneath the island is a chamber full of clones of Jack, Locke, Kate and Sawyer, who keep getting woken up and sent out to act out the same drama over and over. Bernard and Rose are Adam and Eve. The island is a giant computer built to calculate the reason why we humans keep destroying ourselves. It's all a big Room 23-induced hallucination. The island's full of con men, torturers and druggies, because someone or something wants to learn how to manipulate people's sense of reality. The island is the only real place left on Earth, and the rest of the planet was destroyed long ago. In the year 5000 the band Driveshaft will be recognized as the greatest musical visionaries of all time, and the island was set up so the future people could meet their idol, Charlie. The whole thing is just the elaborate backstory to an episode of the TV show Exposé. The island can heal people because of nanites, which are also deeply spiritual. All of the Flight 815 passengers are actually ancient gods, who were cursed to live as humans long ago. The island is Atlantis, which sunk thousands of years ago but was raised again a few hundred years ago by followers of Tawaret seeking an ancient temple. The Dharma Initiative discovered the fountain of youth on the island, and used it to make Dharma beer. Kate and Sawyer are the reincarnations of Bonnie and Clyde. Actually, everybody's the reincarnation of someone famous, and Kate is Cleopatra. Sayid's the only one who's not actually a zombie. The island is actually the back of a humongous dragon, which is about to wake up. Charles Widmore and Eloise are secretly everybody's parents, and they went around the world leaving their babies in different places. The island was the site of a climactic ancient battle between Ptolemy and amphibious psychic mutants, who left behind the principles of their secret arcane science in a dozen hidden amphoras. Ben and Widmore are secretly in cahoots, and they're pulling an elaborate con on Jacob, who has been pitting them against each other. Parts of the island are submerged now, but when the whole thing is uncovered, it's actually shaped like Doc Arzt's head. The four-toed statue is actually life-sized: Tawaret was that tall, and there were several others, who went around stomping cities and squishing people, before they were exiled. Jacob was invisible in his cabin despite being totally visible when he visited the Losties off the island, because you can only see him if you're not paying attention. Also, he said "Help me" because he was drunk. He's drunk a lot of the time. Hurley can see ghosts because he's in the gap between this life and the afterlife, and the island is a doorway between them. The island is actually the world's first shopping mall, and it was designed to bring shoppers there by any means necessary. But the escalators have broken down, and you can't reach the food court, which is between all the Dharma stations. In the reality where Flight 815 didn't crash, Jack saves a pregnant woman - whose baby will grow up to be the next Hitler. Walt is a god, and we're all just his toys. The Smoke Monster is actually just a byproduct of all the electromagnetic force under the Swan station. He gained sentience thousands of year and created the whole rest of the world, so he could have someone to test. Because electro-magnetism naturally wants to test people. It made sense when we were stoned and watching old episodes, anyway. The Dharma Initiative realized that the wheel of suffering, or dukkha, was being powered by the island, and if they could stop the wheel turning, all of the world's illusions would vanish and the truth of existence would be revealed. Unfortunately, when they managed to stop the wheel, they found that everyone on Earth had hideous deformed goat faces. So they sent a team back in time to stop themselves from stopping the wheel, and that team became the Others. So the Others are actually the children of the Dharma Initiative. But they forgot this fact because Jacob got them drunk. (See above.) We're pretty sure this one is the right answer, actually. Lost poster images by Ty Mattson (via Larry Fire), John Gushue, Jim MacLeod and Damon Carlton And A Polar Bear.